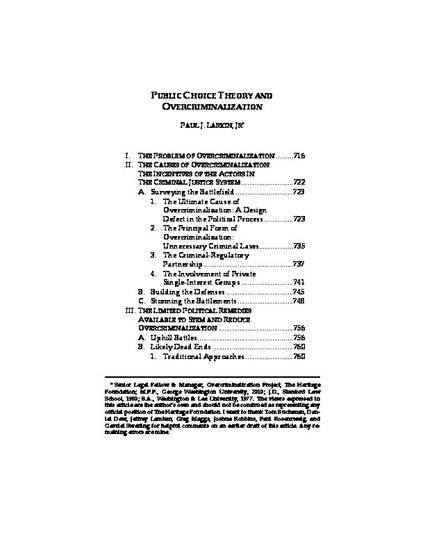 "Public Choice Theory and Overcriminalization" by Paul J Larkin, Jr. Selected Works of Paul J Larkin Jr.
“Overcriminalization” is a neologism used to describe the overuse and misuse of the criminal law, oftentimes to punish conduct that society traditionally would not deem morally blameworthy. Overcriminalization is less a problem with the substantive criminal law than it is with the lawmaking process. Each new criminal law or sentence enhancement may be eminently sensible on its own, but may turn out to be utterly unreasonable when considered against the background of laws already on the books. In economic terms, the marginal benefit of each new criminal law may be nil, yet the marginal cost that each one imposes could be considerable. If that is the case, if we are at the point where any additional contribution to the supply of criminal laws diminishes public welfare, we ought just to leave well enough alone. Having too many criminal laws creates a variety of problems. If the penal code regulates too much conduct that is beyond the common law definitions of crimes or that is not inherently blameworthy, several problems arise: It becomes a formidable task for the average person to know what the law forbids, since the moral code offers no lodestar. It is difficult for the courts to curtail law enforcement excesses, since the police almost always will have probable cause to arrest someone for something. It is challenging for the criminal process to avoid being captured and corrupted by special interest groups, since every private party will vie for economic rents by making a criminal out of a rival. If new statutes are just copies of existing laws with different labels, they are, at best, prescriptions for inefficiency (maybe even useless), or, at worst, fraudulent. If they outlaw the same conduct but multiply the penalties, the punishments become grossly disproportionate to the harm they seek to avoid and empower prosecutors to stack charges against a defendant in order to coerce a guilty plea. And, for those reasons, having too many criminal laws damages the respectability of the process that enforces them.  Public Choice Theory is the use of economic theory to analyze the political process. Public Choice Theory treats political actors as if they were consumers in a free market seeking to maximize their own utility, rather than the public welfare. Public Choice Theory does not require us to make altruistic assumptions about our allies, colleagues, neighbors, or friends. Rather, it assumes, in classic Adam Smith fashion, that everyone is selfish, egoistical, and out solely for himself, regardless of the effect on others that his actions may have. The theory seeks to determine just what impact egocentric political actors will have on the public welfare. Public Choice Theory therefore seems to be a sensible approach for this subject. As it turns out, Public Choice Theory explains perfectly how we wound up in this state of affairs. Contact Paul J Larkin Jr.